Reproductively isolated species share many common traits, a phenomenon known as homology. Homologous features are traits of different species that are of similar design. For example, the grasping hand of a monkey, ape, and human are considered homologous. Even the hand of a human and flipper of a dolphin are designated as homologous because the skeletal structure is similar. The mammary glands of humans, whales, and all other placental mammals are labeled homologous because they all are similar in architecture and function. The contention that homology is indicative of common decent is actually founded on a religious interpretation of the facts rather than science. Evolutionists contend that the only logical explanation for these similarities of design is a genetic relationship. In defense of this conclusion is the belief that an all-powerful creator would not have created homologous features in divergent species. Therefore, the phenomenon of homology, in the mind of the evolutionist, disproves intelligent design. The evolutionist reasons that an intelligent creator would not have been constrained by any pre-existing blueprint and therefore would not have created homologous structures or implemented similar biologic systems in divergent species. In more recent decades, this observation has expanded to include biochemical and genetic homology. Biochemical compounds such as those found in hormones, acid/base systems, and metabolic pathways are comparable in many similar and dissimilar species. On a molecular level, all living things from bacteria to plants to humans possess a genetic code incorporated into DNA. The arguments remain the same; if organisms are similar, the only logical conclusion presented is that they must be related by common descent. Everyone recognizes that striking similarities of structure and composition exist between similar and dissimilar species. 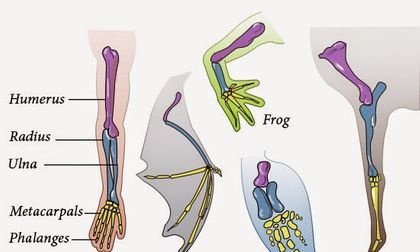 No one disputes, for example, that a bat's wing, a dolphin's flipper, a human hand, and a dog's forelimb are all conspicuously similar in skeletal design. Yet evolutionists continue to cite more and more examples of homology, believing that in so doing they are providing more and more evidence for evolution. "What can be more curious than that the hand of a man, formed for grasping, that of a mole for digging, the leg of the horse, the paddle of the porpoise, and the wing of the bat, should all be constructed on the same pattern, and should include similar bones, in the same relative positions? We may call this conformity to type, without getting much nearer to an explanation of the phenomenon... but is it not powerfully suggestive of true relationships, of inheritance from a common ancestor?" In both of these opinions, the only evidence for common descent that is given is a philosophical interpretation of observations. Gould believed that the flipper of a porpoise wasn't intelligently designed, because its functionality wouldn't require all of the phalangeal bones of a grasping hand. He indicates in the above statement that homologous designs are "imperfect", because he believes that had they been skillfully designed, each would have been engineered utilizing a unique blueprint specifically intended for that animal. To justify his beliefs, he references an alternative theory of how God would have created animals. While many may agree with Gould, it must be understood that this is an ideological opinion, because it presupposes attributes and purposes of Deity. Homology is presented as if it is self-evident that this observation proves evolution. The only way this conclusion can be logically reached is if one presumes that it is inconsistent with intelligent design. If you assume that, you are making a religious assumption. In analyzing the arguments advanced in defense of evolution, this line of thinking is always present. An attempt is made to appeal to the potential skeptic's preconceived notions of attributes of Godhood. The evolutionist assumes that if an intelligent designer created life, all animals would have been created individually and with no prototypical pattern to follow. He assumes that God would create animals in a way that would fit with a specific line of logic. His perception of God is that of a magical entity that would have unrestricted freedom to create life without regard to any natural laws or constraints that may exist. He imagines that if species were intelligently designed, they would not exhibit similarities in form such that man would be able to fabricate stories linking them together. The evolutionist supposes that by showing some phenomenon in nature that is incompatible with his concept of God that he has proven evolution by default. Thus, the argument of homology, which is one of the most widely used arguments to defend evolutionary theory, is based entirely on religious opinion. The current understanding of homology goes no deeper today than what was understood by Charles Darwin. An observation is made, and a conclusion is drawn. There is no evidence presented that homologous structures are related through common descent. Nor is there any effort made to even propose hypothetical pathways of descent in any specific way. Consider, for example, the proposed evolution of the bat. The earliest fossilized bats are believed to be 52.5 million years old. * These bats are essentially identical to modern bats. From analysis of skulls, it has been concluded that they possessed fully developed echolocation ability and were as capable of powered flight as modern bats. Because of anatomic similarities (homology), the evolutionist assumes that the bat evolved from a small terrestrial mammal. A bat superficially looks like a rodent whose forelimbs have become adapted for flight. No endeavor is made to prove that it actually evolved. For the forelimb to evolve into a wing capable of flight, a pathway of gradualistic change would face multiple obstacles. How could a partially developed wing of an animal whose forelimb's functionality had been sacrificed with webbing between its elongated digits have had a reproductive advantage over his predecessors? Common sense indicates that anything less than a structure capable of flight or at least gliding would have been a hindrance to survival. Another obstacle that is ignored is the question as to how mutations could result in millions of purposeful changes in genetic code to effectuate such a change. No comparative analysis of DNA of terrestrial mammals and bats is undertaken to ascertain if such a transmutation is even possible. Given the infrequency of specific spontaneous mutations in nature, how many generations would be necessary and over how many years to achieve the necessary mutations for the evolution of a bat's wing? How could natural selection possibly favor the earliest iteration toward flight over the then existing forelimb anatomy? What are the mathematical probabilities involved? How did the animal’s brain simultaneously evolve to properly endow the species with the exceedingly complex motor activities necessary to accomplish powered flight? How did echolocation and behavioral changes gradually evolve, enabling the flying creature to hunt moving insects at night? These enormous complexities are glossed over or ignored. This is because it is always impossible to objectively reconcile the fantastic claims of evolution with the empirical facts of biology. Critical details are invariably omitted because no logical pathway can be proposed that can withstand scientific scrutiny. Any proposed intermediate forms are not illustrated because such are unrealistic. Probability calculations are invariably omitted, the assumption being that evolution is beyond question, and that the very existence of homology proves common descent. This conclusion has been adopted despite the complete absence of evidence of any bat evolution over a supposed time span of well over 52 million years. * When philosophical assumptions are stripped away, there is no scientific evidence that a bat did evolve or that it could have evolved. The supposition that the appearance of similar morphology proves common descent is justified exclusively on a predetermined worldview. Charles Darwin drew that conclusion over 160 years ago, and evolutionists today hold to the same view. Darwin didn't understand the constraints of fundamental change in species imposed by laws of inheritance. * Today, scientists are well aware that the study of genetics of many homologous structures does not support common descent, yet continue to dogmatically adhere to the same conclusion. This is because they hold a preconceived belief in the truthfulness of evolution, and refuse to question it when the facts do not support it. It is commonly argued that chimpanzees and humans share 98% identical nucleotide sequences, the implication being that an ancestral relationship is obvious because a transition from an ape to a human would be a simple process. Because all life exhibits commonality in many aspects, similar genetic sequences are seen in a wide variety of species. Genetic analyses published in New Scientist have revealed a 75% similarity between the DNA of nematode worms and man. * A 60% commonality between the genomes of humans and bananas has been documented. * Such observations in no way suggest that lower forms of life could be bred into a human. I once asked an evolutionist what genetic studies would prove to him that chimpanzees and humans were the product of intelligent design. His response was, “if chimpanzee DNA was similar to cactus DNA.” This anecdote is not isolated. The only way one can argue that genetic homology proves relatedness is the illogical contention that intelligently-designed life would be designed using dissimilar-appearing genetic instructions. In other words, a God would need to reject science and practice magic. In an exhaustive paper summarizing the evidences for evolution, Douglas Theobald, Ph.D, argues that the common genetic code provides undeniable evidence for common descent of all living things. He noted that every day new species are catalogued, and approximately 30,000 new genetic sequences are deposited in a data base. He concluded that "each and every one is a test of common descent. "* In summary he declared that “the molecular sequence evidence gives the most impressive and irrefutable evidence for the genealogical relatedness of all life.”* Theobald's conclusion is based entirely on the assumption that molecular homology is incompatible with a model of intelligent design. This is not scientific evidence. This is religious opinion that has the appearance of science. It is contended that the existence of so-called Hox genes that perform identical control functions in many diverse species is proof of common descent. The conclusion of the Hox gene as providing evidence of common descent is nothing more than an extension of the argument of homology. It is assumed that a divine creator would follow a completely different pattern in programming the genetic code for divergent species. The proposed evidence of genetic similarities sounds impressive only to someone who is not familiar with genetics or has restricted his interpretation of nature to the evolutionary paradigm. The documentation of homologous DNA sequences between species does not provide any evidence of actual ancestral relationships unless one excludes intelligent design from possibility. The entire argument of homology rests on the belief that because species look related, they were not intelligently designed and therefore are related. The belief that intelligently-designed life forms should not exhibit homologies is scientifically illogical. No one on earth understands the challenges that would be faced in writing a genetic code for a complex animal. Yet many biologists believe they can look at DNA sequences in an animal and judge whether or not it was intelligently created. Such a position is founded only on religious opinion coupled with a mindset of extreme arrogance. Dr. Berra does not document that diverse life forms are related, he supposes that they are related because he can't any other explanation for all life to be based on a common genetic code. The interpretation that a single genetic code proves evolution is founded on a belief that an intelligent creator would not confine himself to one genetic code in the creation of all life. This philosophical assumption is made without scientific evidence that any other type of genetic code designed to support life is possible. If man's knowledge of molecular biology and comparative anatomy went no further, the argument of homology would have to be regarded as exceedingly weak evidence for evolution as opposed to special creation. If animal life was created through intelligent design, there's no reason to assume that chimpanzees and humans wouldn't share many common genetic traits. It is unclear what would be expected in analysis of chimpanzee DNA that would disprove evolution. Given the fact that man actually knows very little about the requirements of creation, it is illogical to suppose that one method of genetically programming a species is preferable to another, or that God would conform to certain standards imposed by man-made logic in the process of creation. It is commonly stated that DNA homology is absolute proof of common descent. This is not remotely true. The conclusion of common descent relies on the assumption of evolution, i.e., the assumption that life was not intelligently designed utilizing similar DNA sequences. In other words, the argument of DNA homology is not a scientific argument, but a religious one. It is frequently declared that molecular evidence for evolution proves common descent in the same manner as DNA evidence is used in courts of law to prove genetic relationships. Such a comparison is flawed, because no one disputes that every human is related to every other by common descent. No human can appear in court and claim to have been independently created. The DNA of all human beings is 99.9% identical. DNA profiling is founded on analysis of highly variable sequences that have proven correlation between varying degrees of relatedness documented through birth records. The purported DNA evidence of common descent between apes and humans is founded solely on similar sequences that do not vary from one individual to the next. The entire argument of genetic homology relies on the assumption that if two separate species were intelligently created, no DNA homology would exist. It is unclear what would be expected in analysis of chimpanzee DNA that would disprove evolution. Given the fact that man actually knows very little about the requirements of creation, it is illogical to suppose that one method of genetically programming a species is preferable to another, or that God would conform to certain standards imposed by man-made logic in the process of creation. The DNA of all human beings is 99.9% identical. DNA profiling is founded on analysis of highly variable sequences that have proven correlation between varying degrees of relatedness documented through birth records. The purported DNA evidence of common descent between apes and humans is founded solely on similar sequences that do not vary from one individual to the next. The entire argument of genetic homology relies on the assumption that if two separate species were intelligently created, no DNA homology would exist. A founding argument used to support evolutionary theory today is genetic homology. For example, multiple identical segments of genetic code (transposons) are seen in different species. Their existence is argued to provide irrefutable evidence for evolution. These segments are included in the category designated junk DNA because in many cases a function has not been proven. It is thus argued that identical "useless" segments of DNA in isolated species proves common descent. Short segments of DNA termed endogenous retroviruses (ERV's or viral insertions) are seen throughout the human genome. Based on the assumption that these represent viral parasitic sequences, it has been assumed that these are useless leftovers from an evolutionary past. Hence, their arbitrary inclusion in the category of junk DNA. Since these are seen in similar locations in the DNA of various species, common descent is said to be an inescapable conclusion. It must be understood that "viral insertions" contain similar, but not identical nucleotide sequences to exogenous retroviruses. Evolutionary theorists believe that in the ancient past viral infections of germ cells which produce the egg and sperm resulted in perpetuation of these viral segments in the DNA of the host. Therefore, species with similar sequences must share a genetic relationship. While this seems like a logical conclusion, it is no different than any argument of homology. All life has remarkable commonality, particularly at the cellular level. The foundation of the belief that “viral insertions” represent past viral infections is reliant on the assumption that DNA sequences in higher animals are indeed a result of viral infections as opposed to another example of molecular homology between viruses and higher animals. Ultimately, the interpretation of the existence of these purported segments of viral code has been reliant on the assumption that these segments are functionless. If a virus randomly inserted its DNA into a host, it is assumed that the result would be a worthless segment of genetic code. This doctrine which has been propagated for years in university biology courses is patently false. Numerous peer-reviewed scientific papers have documented tens of thousands of functional "viral insertion" sequences, aiding in transcription of over one fifth of the human genome. Many of these include regulatory functions in prenatal development. For several decades, evolutionists have utilized the existence of "viral insertions" as a poster child of organic evolution. With the realization of vital functionality of many of these sequences, many evolutionary biologists are now entirely rethinking this paradigm and have hypothesized that these sequences came first, and that viruses originated from them. Evolutionists in the 1970's logically predicted that the parasitic insertion of random segments of DNA, hundreds to thousands of nucleotides in length, would result in no functional gain for the organism. With the discovery of functionality of ERV's, most biologists have not questioned the validity of the evolutionary paradigm. The argument of transposons and other elements of "junk DNA" is no different than any other argument of homology and imperfections of nature. It presumes that a creator would not use similar genetic programs for different species. The existence of what are deemed useless segments of genetic code is concluded to represent poor engineering. It is therefore deduced by default that such an illogical genetic code with redundant segments must be the product of evolution. These conclusions are maintained despite the fact that many of these DNA segments have been proven to possess vital functionality. For evolution to be credited with creating the extremely complex genetic code through random mutations, biologists have expected to find numerous redundancies and other imperfections of nucleotide sequences. Because of these evolutionary assumptions, the mysterious genetic code has long been assumed to be imperfect, despite man's minimal understanding of it. Hence, the continued use of the junk DNA label. The interpretation of molecular homology relies on one's paradigm of thinking. All life has commonality in terms of basic biological systems. One cannot logically assume that a given sequence of code is unique for a virus. If this were true, all ERV's would be non-functional. However, the fact that thousands of these segments have proven functions logically leads to the conclusion that these do not represent previous parasitic infections.